The February-March Western Angler is out now and, as always, there's plenty of great reading for anglers of every skill level. 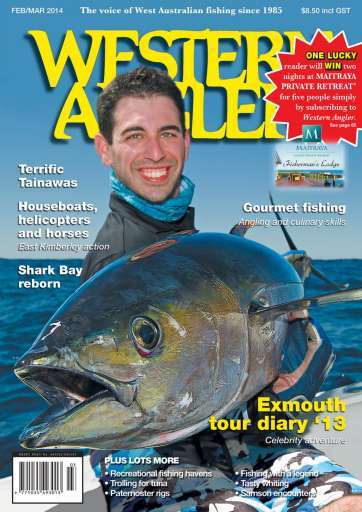 On the cover is a fantastic yellowfin tuna caught by Michael Sammut during the Western Angler Celebrity Adventure in Exmouth. You can read all about that trip, including some exciting billfish action, with a trip diary by Scott Coghlan recounting all the action on and off the water. Scott also looks at some of the great angling options on offer around Kununurra, where the barramundi fishing could be about to enter a new era. Jamie Chester takes a closer look at Tainawa works and what they can offer bait fishers. Cooking the catch is an important part of the fishing experience for many and Chris Stannage hits the Scottish Highlands with a yarn to whet the appetite. 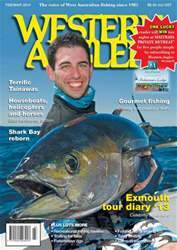 Peter Anderton also looks at the shallow-water fishing available in Shark Bay. The usual columns cover a wide range of topics, including recreational fishing havens, unusual samson fish captures, tuna trolling tactics, the big questions in kayak fishing, tips for getting that great jump shot, and the perils of mud crabbing. Plus some great footage, including barra action from a helifishing expedition in the Kimberley and bluewater excitement in Exmouth.